I must say that some times is not about reinventing the wheel it’s just about perfecting it. That’s what this recipe-non recipe is all about. Just look at it! Isn’t it gorgeous?…It’s not only very attractive, it’s packed with amazing flavor. Like I said, this recipe is about making a burger in the better way possible. What makes this burger special? The HOW to. The big question I asked myself when starting this recipe: What’s in a classic burger and how can I make it better when I’m at home? 1. 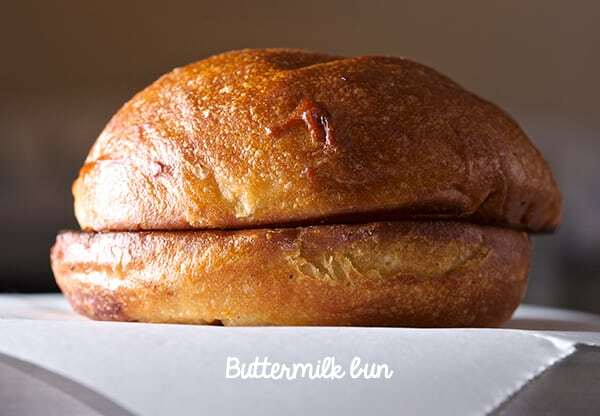 Great Buns: A bun that holds your burger, but lifts and hugs her like a koala hugs a tree, like a bra that lifts and push beautifully. 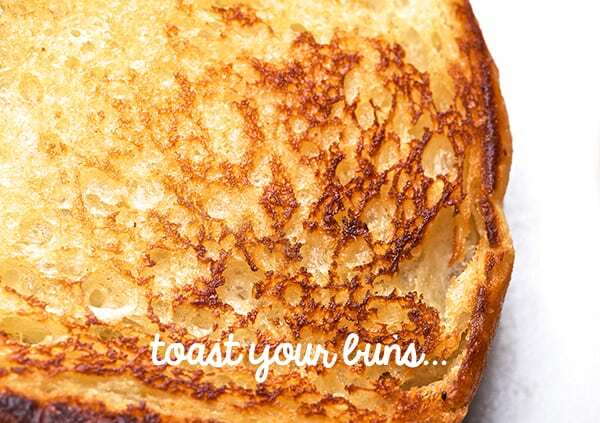 Do yourself a favor, toast your buns makes a big difference. I used buttermilk buns. 2. Tomato: Instead of using a wimpy thin mushy tomato slice…How about a luscious thick slice of a juicy, meaty, heirloom tomato goddess. Why settle for a flavorless tomato right? 3. Onion: Onion place a great role on the burger it adds that bite that contrast between the sweet ketchup, sharp salty mustard and plays so well the crunchy juicy roll in it. So I will go with red onion. Besides being sharp adds color, and visual appeal. Note: Be kind to your guests and family members by rinsing the onion slices. 4. Lettuce: this leafy green is not only for decoration and color, the lettuce play an important role on the burger, adds a crisp bite, where the meaty fatty molecules from the patty and bacon expand and maximize the flavor. 6. 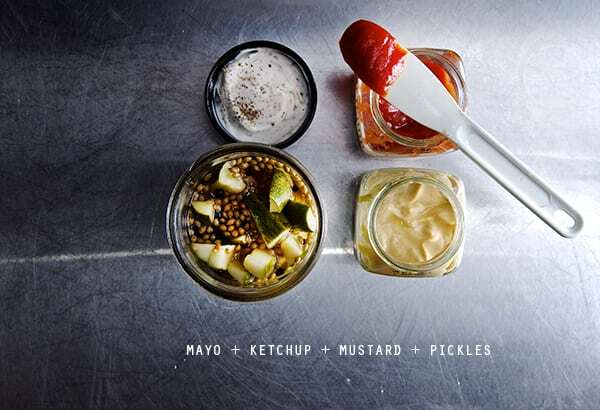 Condiments: For me, a burger is not complete without the trilogy: mustard, mayo, ketchup. My absolute favorite condiments: Sir Kensington’s. 7. Pickle: Always the best Burger co-pilot will be the Pickle. I love Thomas Keller’s recipe for sweet quick refrigerator pickles. Check it out if you want to make your own. 8. Cheese: Mild Cheddar, or Colby that’s what I prefer on my burger, it has enough character, but does not overwhelm the burger. 9. The PATTY: Let’s talk about meat. 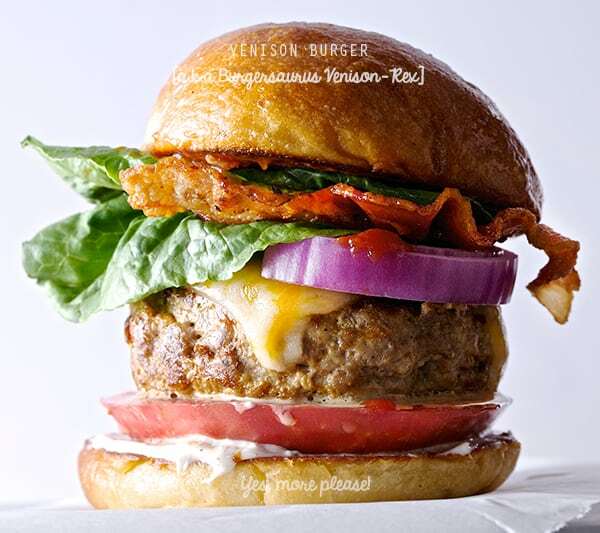 Classic Burger mix usually mixes a fatty cut for flavor and moisture and a leaner cut for yield, shape and texture. What ever is your choice of meats make sure you are using 80% of the leaner cut to 20% fatty cut. Blends that I recommend: Sirloin and Chuck steak, Turkey and Pork, Lamb and Sirloin, Venison and Pork. In this case to indulge we had ground Venison, provided by our good friend Marc “the hunter” he was very generous and share with us his fabulous ground Venison. I know is hard to get this precious meat, but if you are in Texas you are blessed. There are many places you can easily buy some of this delicious meat. I added some links at the end of this post for your convenience. 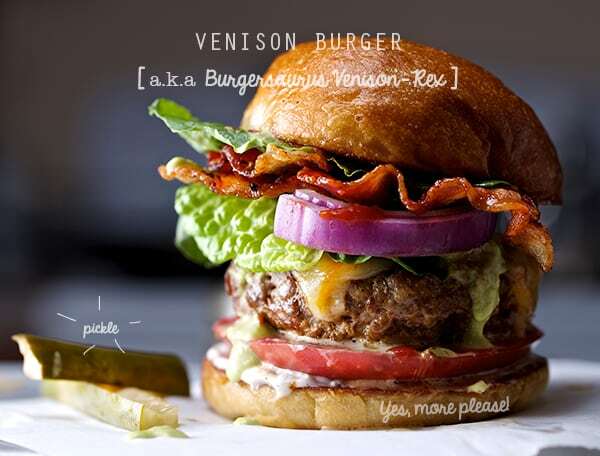 The delicate meaty venison flavor is worth going the extra mile on this burger. When mixing your ground meat do not over work it. Use forks to “fluffen”the meat morsels to incorporate the ingredients. Shape the patties, but don’t compress. Think of tenderly thoughts when making the rounds, you just want the meat to stay together with out pressing to hard. What ever you do please, do not treat your meat mixture like play doh. Make an indentation in the middle, it works like a charm. Your patties will cook more evenly, with no bump in the middle. A totally acquired method to the hump madness, thank you Rachel!. After I shape my patties, I place them in a tray lined up with some parchment paper and put them in the freezer for about 10-12 minutes. This chill helps the patty to hold its shape better when is time to cook them…watch out though, you don’t want to go to far and freeze them! Your pan, grill or griddle has to be screaming hot to create a nice crust and sear! The sear will keep the patty moist on the inside while giving a crusty crust on the outside. Please respect the patty!, once you place it into the pan, do not move it, no poking or pressing down with a spatula! You are just squeezing out the juices… be gentle and patient. Turn the patty just once. This will ensure you’ll have a moist inside and no though interior. Hold your seasoning horses! Try Salt and Black Pepper. For me this is enough. I want my patty to taste like meat to the max!… the rest of the accoutrements come later. Last but not least, listen to good music while you cook, have fun, be ready for a great burger love, and make it awesome. Any way friends, this is my version os a crazy good homemade burger…fries?.. that’s a whole other chapter. 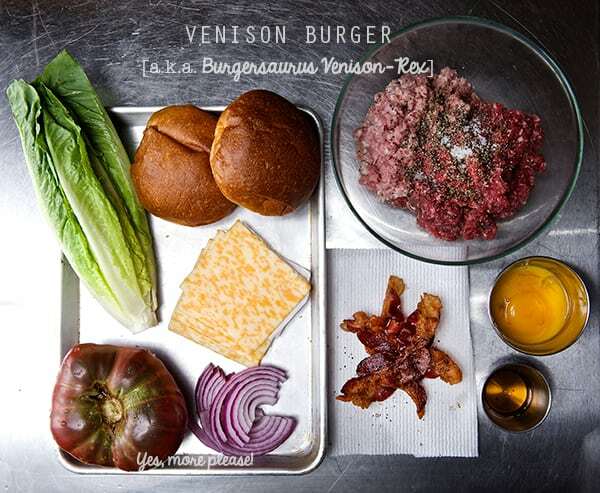 Meantime, keep yourself busy with this VENISON BURGER (a.k.a Burgersaurus Venison-Rex). a little butter to toast your buns. 4 thick slices of red onion rinsed and pat dry. 6-8 leaves of Romain, Iceberg or your favorite kind. 1. Prepare all your lettuce, tomato and onion slices. Gather all your condiments and spread spatulas. 2. Crisp up your bacon. Reserve 1 tablespoon of the bacon fat. 3. Cut your buns and spread some butter, have them ready when the time comes to toast them. 4. Prepare your meat, In a chilled bowl combine the ground venison, ground pork, 2 egg yolks and the tablespoon of reserved bacon fat. Using to forks combine all the ingredients, remember not to over work the mixture. Venison is a very lean meat, therefore I’ve added some egg yolks and a little bacon fat to keep them moist. 5. Line up a tray with parchment paper and divide your ground mixture into 4 and shape your patties, be gentle and do not compress. Place them on the tray and make a concave indentation in the middle (see photo below). Place them on the freezer for 10-12 minutes. 6. On a screaming hot griddle, cast iron skillet or grill place your patties at least 1-2 inches apart. Remember, do not crowd the pan, use a bigger skillet, and place one patty at a time. Wait for about 1 minute interval between placing the next patty into the pan to give a chance to the pan to bring the temperature up to screaming hot. 7. Each patty will take around 3-4 minutes the first side. Flip them until you can see that brown crust is formed.Once you flip them, place the cheese slice on top. It will take a little less time like 2-3 minutes to finish cooking. 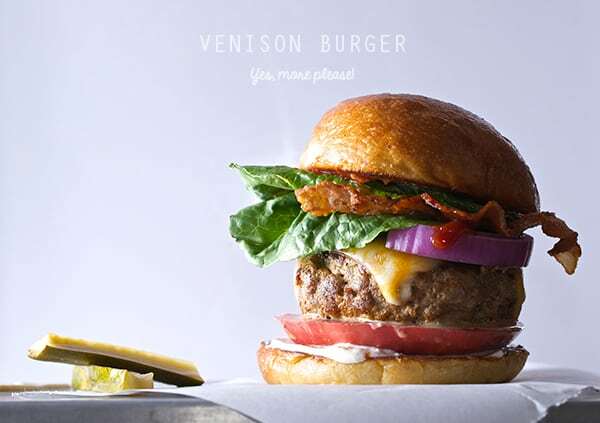 Venison cooks faster than meat, check your burgers at all time, adjusting the temperature if they are browning to fast. If you are using other mix of meat please adjust the cooking time maybe by adding an extra 1 or 2 more minutes upon how well done you want your burger. Apply mayo on the bottom of the toasted bun, then tomato slice, patty, bacon, onion , ketchup, lettuce, spread some mustard on the top bun. Press a little, pickle on the side to munch on every other bite…done! Please, do what ever you want to do, do not listen to me on this one, this is just the way I like it! Home made Burger = mo betta! for sharing with us his awesome ground venison. Where to get Venison in Austin?